Middlesex University has launched a new online platform from where its expert researchers can share their perspectives on the most important global issues of the day, as well as updates from their latest research projects. It is hoped that mdxminds.com will appeal to a wide range of audiences, from engaged students to researchers and members of the public. 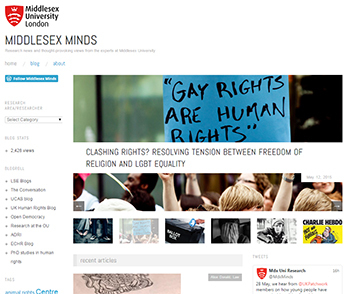 Issues tackled already include the General Election, Cecil the lion and freedom of speech, with contributions submitted from across the diverse Schools and research centres at Middlesex. The blog is also linked to a brand new Twitter channel, MDX Minds, which has been the focus of lively social media discussion around hot topics such as whistleblowing. Commenting on this development, Deputy Vice-Chancellor Academic Professor Waqar Ahmad said: "Following our excellent REF results and the huge surge in funding we've received for 2015, it's fantastic that our academics now have a dedicated space where they can share their outstanding research to a broad audience." In the 2014 Research Excellence Framework (REF), Middlesex was ranked as the best modern university in London for research power, with 92 per cent of the University's research internationally recognised. As a result, Middlesex received the highest percentage increase in research funding across London when the Higher Education Funding Council for England made its funding announcement in March this year.